Siphiwe Sithole has been a Black Mamba for 2 years. She is eloquent, educated and well versed in conservation. 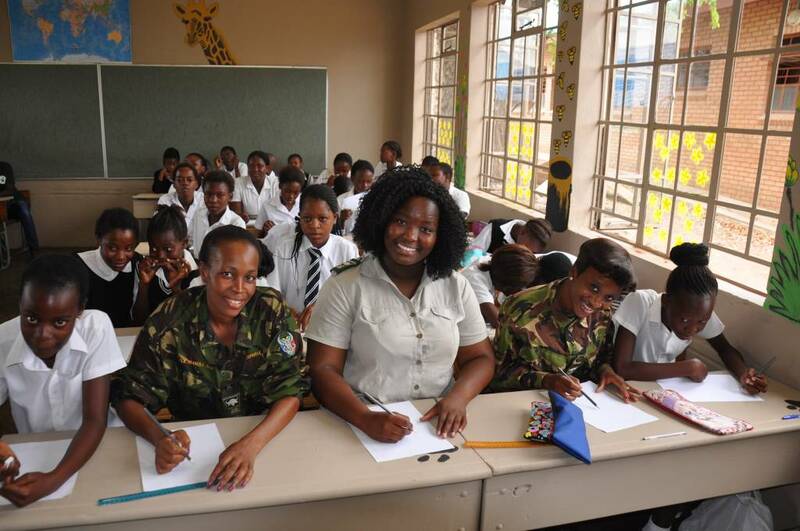 She visits schools as part of the Bush Baby programme and will be one of the two Black Mamba ambassadors to visit the UK between the 22nd and 29th of February 2016. I was privileged to have an exclusive one on one interview with Siphiwe while filming with The Black Mambas in January 2016. A: When did you decide to join the Black Mambas? A: Why did you want to join The Black Mambas? A: What did your family think when you told them you wanted to become a Black Mamba? A: Have you ever come across a dangerous animal such as a lion? S: Yes, twice. The first time was when I first started working as a Mamba. I ran from it which was wrong, you should never run from a lion. After this, I was put on a special course which taught me how to deal with wild animals should I ever meet them. I then met some lions for a second time and this time I knew how to behave. A: Do you feel that in your community that a lot of people already feel very sorry for the rhino or do you feel that its more about education, so they understand more? A: It’s quite scary when you look back in the 1970’s, that between 1970 til now, we’ve lost 50% of the world’s wildlife – its gone. Its serious and even a lot of people in the Uk don’t know about this, it’s a massive shock to them, so here in Africa, do you think that this is something that people would know about or is it something they don’t think about as the information is not there in the schools? S: Since we are going out in the communities and the schools teaching about the poaching, I think that the people are now recognising that we are having a big problem, because if they keep on poaching the animals it means that at the end of the day, the conservation will be gone and if we don’t have wild animals, it means that something wrong will come up, as I believe each and every species in the world is playing an impact in our lives, so I think that they are now realising that poaching is not good, but through the awareness we are teaching each and every day. A: And from your experience of poachers, do you feel that they come from very poor backgrounds, so they are desperate, I’m not just talking about rhinos, but we are also talking about bush meat so I am thinking that there are people out there who need to feed their families and it’s probably quite a desperate situation for some people. Do you think that some people are pushed to the edge to do it or is it maybe a lazy way to get the food? S: I think that people like easy things, they don’t want to work. Some I can say is 50:50, because some they are pushed because they don’t have anything at home, then the best thing I can do, when a rich man come to me and say go get a horn, a rhino horn inside the reserve, I can go there, I’m just giving an example, I can go there and can be having 30,000 in a minute….but those ones who are doing bush meat, I think also they are just – it’s to be greedy, because in their mentally there is that thing that conservation is for white people, we’re are not involved in anything, did you see a black person running a private lodge or a private game reserve, so we have to finish the animals so also the white people won’t have. 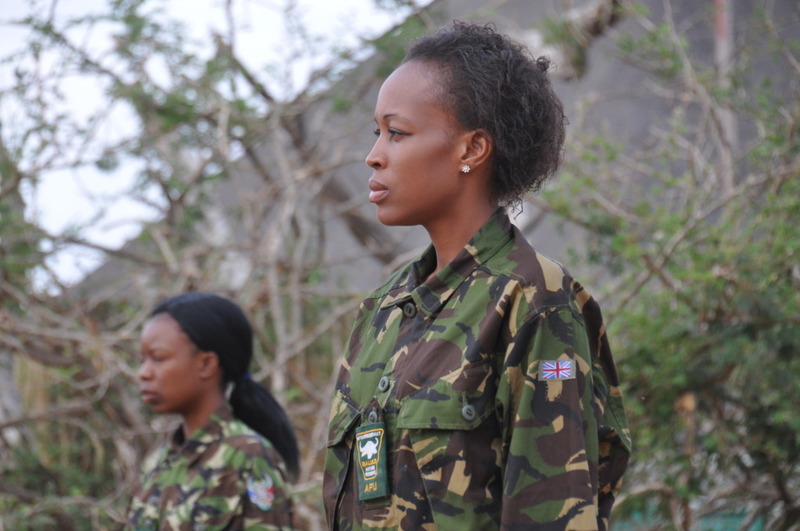 A: Do you feel there’s not, apart from the black Mambas, do you find its difficult to get jobs within the reserves, is this what the communities feel? S: Yeh I feel that the communities feel like they are not benefitting anything, it’s only the land owners and everyone who is benefitting who are attached to the private game reserves. The people at home they are not benefitting, of which it’s not true, because I mean there is a lot of women and men who are working inside the lodges and the game reserve, so it means the community is benefitting but we cannot come and work inside a reserve, all of us. It has to be some people and then when there is an opportunity then they will call on us, it’s just like that. A: I think that really this is the cradle of the earth, you know, when you look at the whole earth and you see the wildlife, from my point of view, this is where it all is and you know it’s really important to keep this going. I would love to see you guys inspire the next generation because I think it’s not a white man’s thing, you guys have so much power now to get in and do so much good. I’d love to see you guys coming in and saying you know what, this is my wildlife and we have to look after it for the next generation, feeling proud and inspiring your children and your children’s children and to come and look after this for the rest of the world, as the rest of the world cares, they really care. In England, we are very, very sad about what is going on, so I think The Black Mambas are ever so important. A: and with the poachers, do you find that, with rhino poaching in particular, it less of a poor man’s thing and it’s become more of a drug cartel, it’s like big, big money, so you have more of the gangs and more rich people are trading in this, is this what you feel? A: So when they break in, do you find that they have very good technology, good tracking…better than the gamekeepers sometimes? 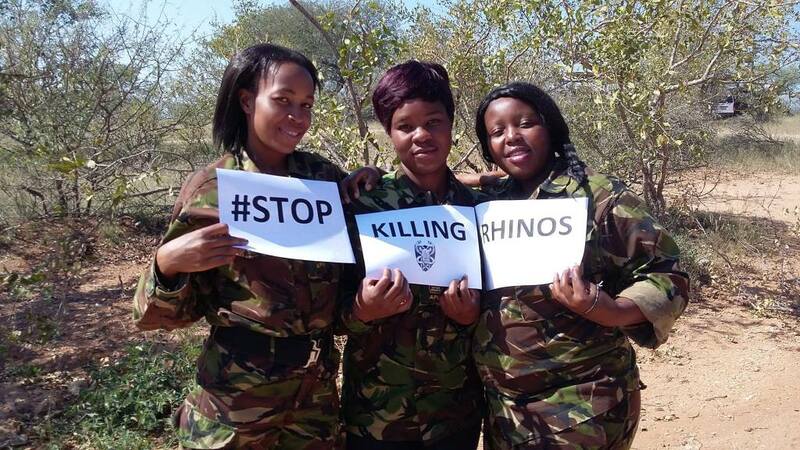 Do you feel that sometimes they are one step ahead, because they have some money to go find the rhinos? S: No I can’t say that, because they don’t know exactly where the rhinos are, so the rich people are using the vulnerable people. A: So the rich people may hire, pay a local person who doesn’t have a lot of money and say show me where the rhino is? A: and so do you think with the poor people in the community that are being paid by the poachers to do the tracking and do the dirty work, that this might change if they were given jobs in conservation, like what you’re doing. If they had a job to help the rhino, to do something that makes them feel good each day, do you think it would help stop the poaching? S: I think it will help but what could help more is changing their minds. Either you are working inside the reserve or you are not working inside the reserve, poaching animals is not good, it doesn’t give you that justification, I’m doing this because I’m poor, I’m doing this because blah blah blah…I think what they need is to change their mind. That we need to protect this for our future generations, not because its for this person, or this person, you just need to do it for your own..
A: The wildlife belongs to the planet and if we leave it too long…..
A: and as far as its helped you being a Mamba, growing up, was your village quite poor or was it ok? S: My village I can say was quite poor, but not that much. A: How about education? Did you feel that the schools were teaching you everything or do you think they could be better, teaching you more about conservation? S: I can say that back then, it was not teaching that much about conservation, but since there is this programme; there are lots of private game reserves who are trying to get to the kids at school and teach about conservation, so now I can say it has improved very much. A: and having a job as a Black Mamba, that’s helped you a lot with your family? S: Yes, it has helped me a lot, because now I can take care of my kids, I know if I want to do something now, I’ve got something in my pocket, I’ve got money..
A: Are you the main supporter for your family, are you the bread winner? 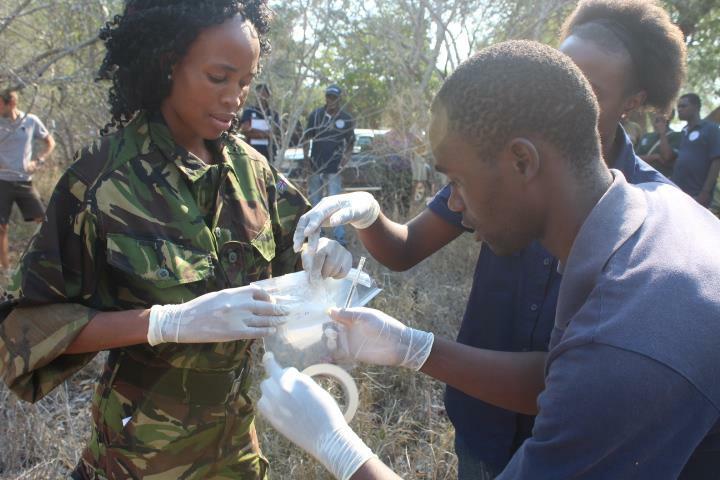 A: so if there were more Black Mambas, that would help a lot more the community, do you feel? 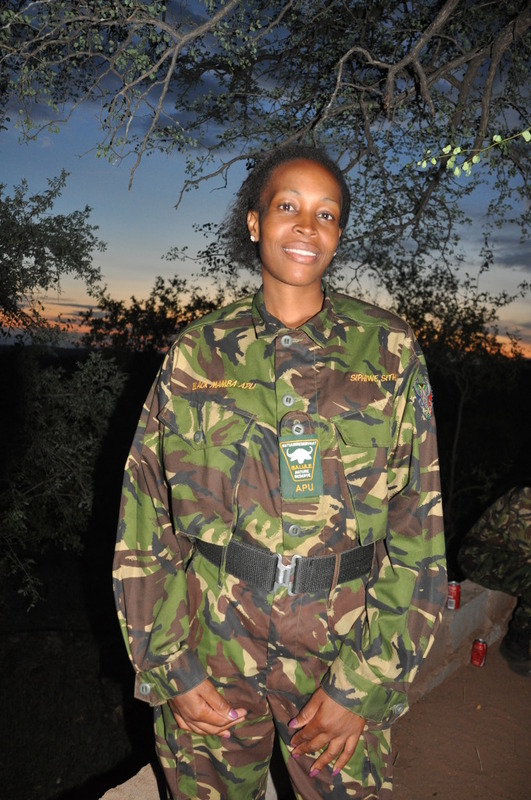 Siphiwe and her colleague Felicia will be visiting the UK on the 22nd of February 2016 for a week long tour and screening of the Helping Rhinos Film. 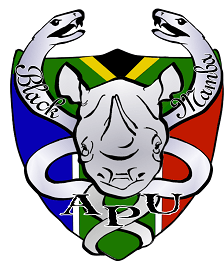 To find out how you can reach the Black Mambas during this week visit, please fill in the contact form on this website and we will forward your query to the correct people.